A collection of 445 multi-featured, very different solitaire card games to play. You will be able to learn solitaires not found elsewhere. BVS Solitaire Collection includes over 100 original solitaire variations not found elsewhere. You won't find so many original games in other programs. 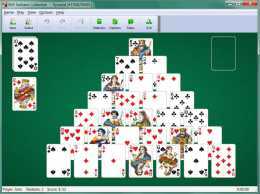 It also includes all of the most popular solitaire card games such as Spider Solitaire, Klondike, Freecell, Carpet, Forty Thieves, Monte Carlo, Russian Solitaire, Flower Garden, Golf, Cruel, Accordion, Pyramid, etc. And you can modify rules of almost any of the included games, thus creating your own solitaire variation. BVS Solitaire Collection gives you the plethora of statistical and scoring screens.Track your performance and progress in playing solitaire, and even publish your personal statistics on the BVS Solitaire Collection web site to appear in the top scores list. If you're tired of Klondike, check out this unique collection. Even if you've played a lot of solitaire these games will definitely be new to you.